After hotel pickup in Tokyo by air-conditioned coach, your day trip begins with the 30-mile (50-km) drive south, through the capital city’s outskirts, to the city of Kamakura on Sagami Bay. At Jomyo-ji Temple, enjoy matcha — powdered green tea — in the refined and tranquil atmosphere of a tearoom constructed over 400 years ago, and enjoy views of the Japanese rock garden. Later Visit to Hokoku-ji Temple, a renowned temple of the Rizal sect’s Kencho-ji school that features a beautiful bamboo grove. 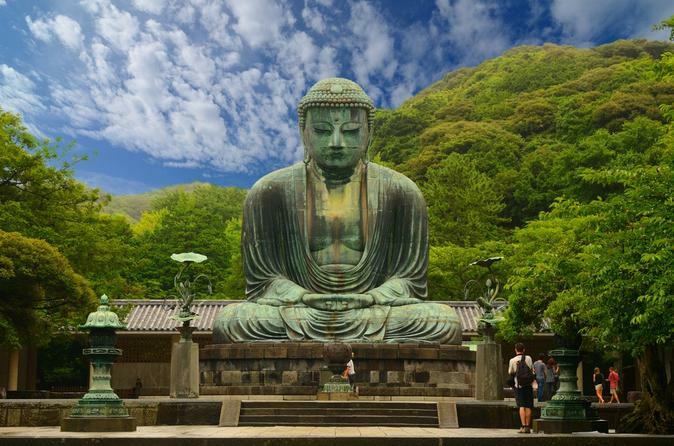 The highlight of the tour is to visit the Great Buddha of Kamakura at Kotoku-in Temple. Dating back to 1252, the monumental outdoor bronze statue is a national icon. Peer into its interior (the statue is hollow), and then step back to take a photo of the whole Buddha, which stands at a height of 43 feet (13 meters). Then enjoy a Japanese lunch at a hotel and then head to Enoshima before the tour concludes in Tokyo.